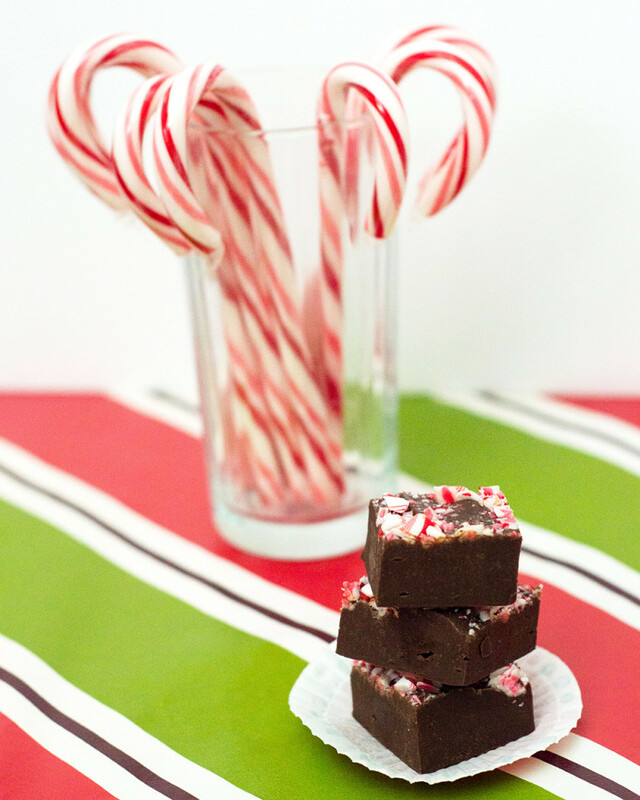 Easy, no-bake five-ingredient peppermint mocha fudge makes a delicious holiday party treat, or a sweet homemade gift. In this hectic holiday season, who couldn’t use a fast, easy treat recipe that’s perfect for giving away as a gift, or bringing along to a holiday party? 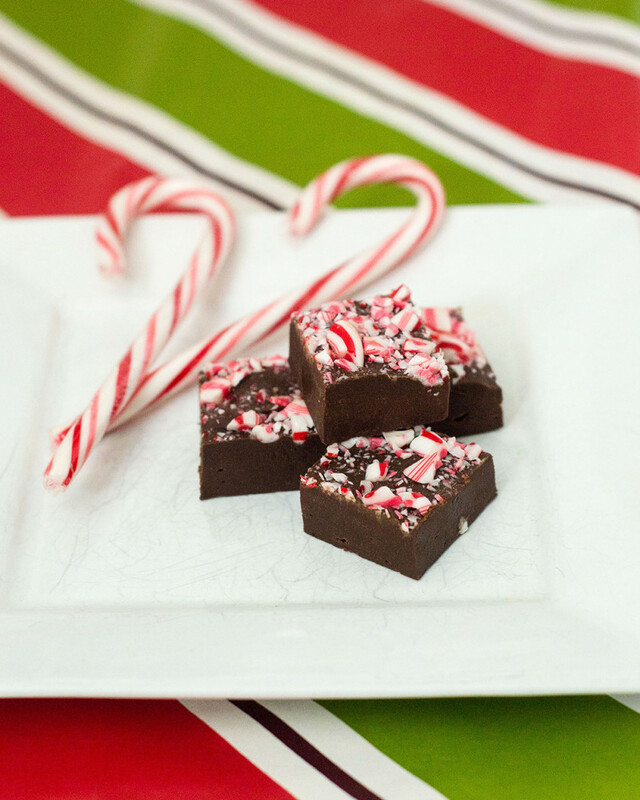 This festive, sweet fudge doesn’t require any baking. Old-fashioned fudge requires a candy thermometer. This shortcut fudge uses condensed milk, and is ready in about half the time. Fudge is a very underrated sweet treat. Everyone is all about the cookies this time of year (for good reason, I’m not knocking cookies). 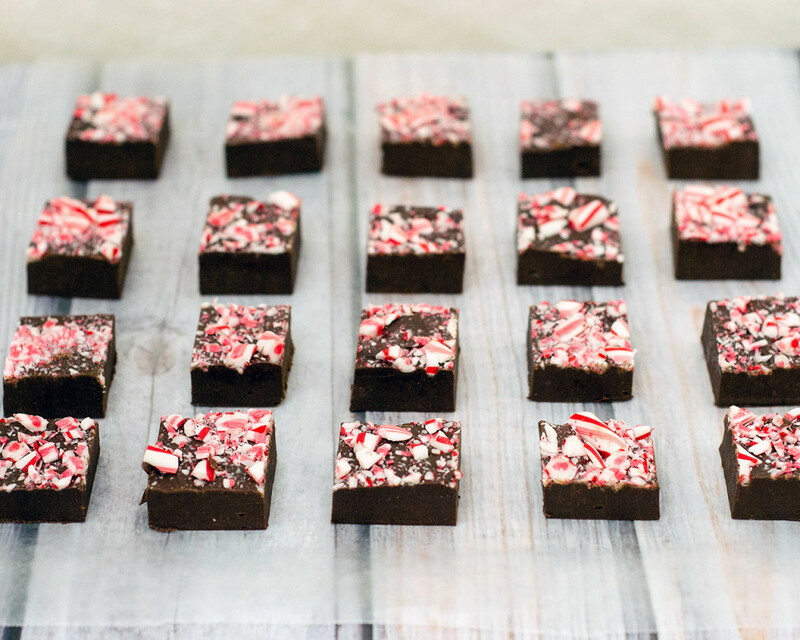 Stand out from the crowd, and when everyone is bringing cookies to a holiday party, bring a tray of decadent peppermint mocha fudge. 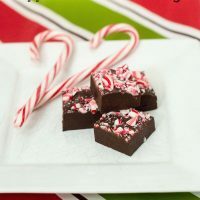 I was preparing to make plain old candy cane fudge, but when I stopped to pick up my favorite seasonal latte, a peppermint mocha, I thought how delicious that flavor would be in a square of fudge. The coffee flavor comes from instant espresso powder. Instant espresso is available in most grocery retailers. If you can’t find it, you can use instant coffee granules, but increase the amount to 2 1/2 teaspoons, since the flavor of instant coffee isn’t as strong as espresso. Leftovers (if there are any!) will keep in airtight container in the refrigerator for up to 2 weeks. Line a 9-inch square baking pan with wax paper, leaving a 4-inch overhang on two sides. Place the sweetened condensed milk, chopped chocolate, butter and salt in a medium heavy-bottomed saucepan and set over medium-low heat. Stir constantly until the chocolate and butter are completed melted and the mixture is smooth. Scrape the mixture into the prepared pan. Dampen a small offset spatula and spread the mixture evenly and smooth the top. Sprinkle the crushed candy canes evenly over the surface and gently pat the pieces so they slightly sink into the surface of the mixture. Cover the baking pan in tinfoil and refrigerate until the fudge is set (about 1 hour). Once chilled, you can lift the fudge out of the baking pan using the wax paper overhang. Set the fudge on a cutting board, and cut into 1 1/2-inch x 1 1/2-inch squares. Store in airtight container in the refrigerator for up to 2 weeks. This giveaway is sponsored by the bloggers listed above, and is not affiliated with Amazon.com. Christmas Week Amazon Gift Card Giveaway is open to U.S. and Canada. Giveaway will run from December 7, 2015 to December 26, 2015. Winners must be 18 years of age. Winners will be notified by email. Winners will be asked a skill testing question. I love making fudge during the holidays. 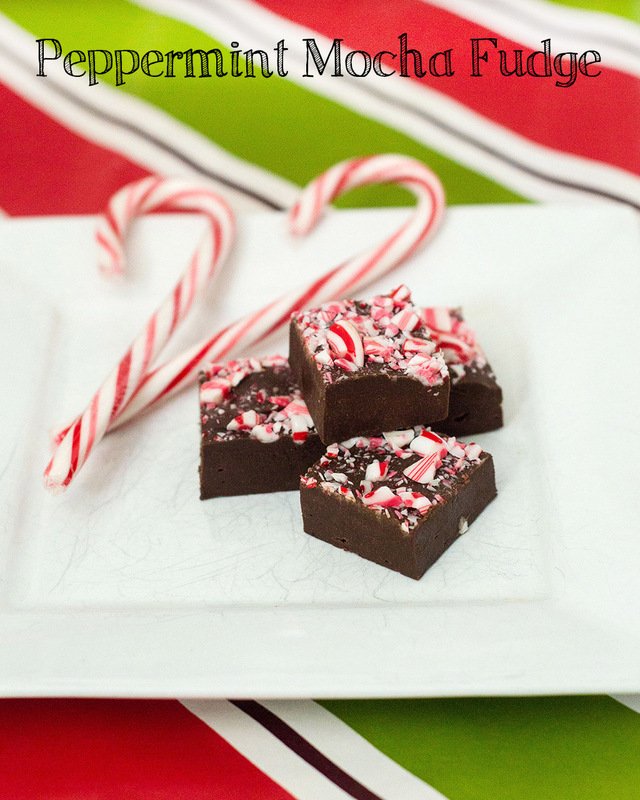 I’ve already made peppermint fudge just using peppermint extract. It was 3 minute fudge. Yum! I love to make spritz cookies for the holidays! Those fudge pieces are SO perfect. I’m jealous. I definitely need these in my life. I love that you added espresso into the recipe. They truly are gorgeous! Our favorite family treat, believe it or not, is pineapple cream pie! My MIL would make it every Christmas. I often make tiger stripes. They are marbled milk and white chocolate mixed with chunky peanut butter. Every coat lasts about a year in the water. I’m impressed that you get inspiration from your favorite seasonal beverage! I’m sipping an iced chai latte–because it’s still iced chai tea latte season this year–but wouldn’t have the first clue how to turn that into anything other than a DIY Iced Chai Tea Latte. Well done! soft and chewy gingerbread cookies and also peppermint bark, so delicious! I tend to shy away from fudge because of the whole thermometer situation. This fudge, though is amazing. Love the use of condensed milk and love that you turned your favorite drink into this fudge!! Homemade Maple Candy from ;cooking in Stilettos . This looks amazing. I love peppermint fudge. It’s one of my favourite kinds of fudge. I’m so happy you joined us for Christmas Week. ps it looks like you have broken links in your recipe list, you probably need to update them with live links. You can find them in the group. I love the combination of chocolate and peppermint. 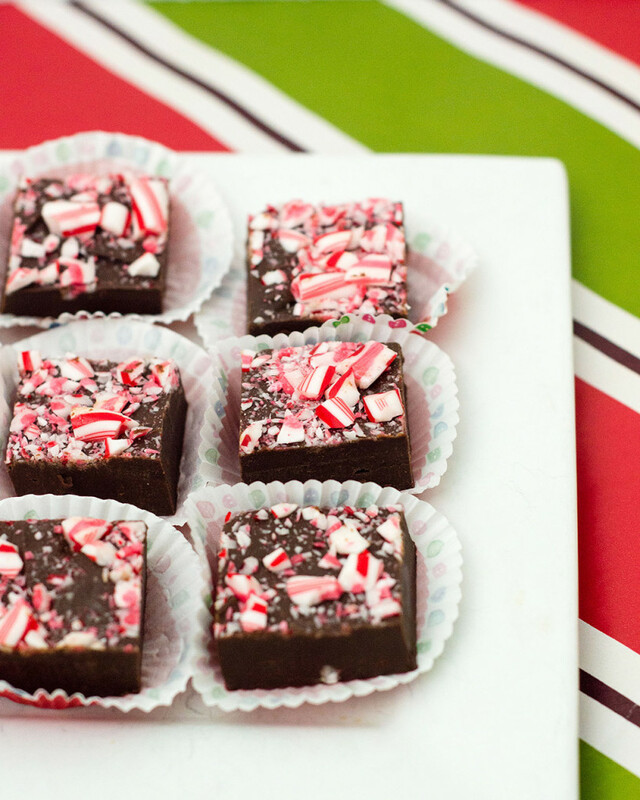 And the way you got the peppermint to sit on top of the fudge – so tempting!